Professor Tom Sorell read Philosophy at McGill University and received his bachelor’s degree in 1972. He later went to Oxford University for graduate study and obtained his BPhil in 1975 and DPhil in 1978. Professor Sorell taught at The Open University, UK (1979–92), and later at the University of Essex (1992–2006), where he became Professor of Philosophy in 1995. He was also the Director of its MA and Doctoral Programs in Ethics, Politics, and Public Policy (1995–2006), and Co-Director of Human Rights Centre (2003–05). In 2006, Professor Sorell moved to University of Birmingham as John Ferguson Professor of Global Ethics, where he directed The Centre for the Study of Global Ethics (2006–2012). He recently joined the University of Warwick as Professor of Politics and Philosophy. 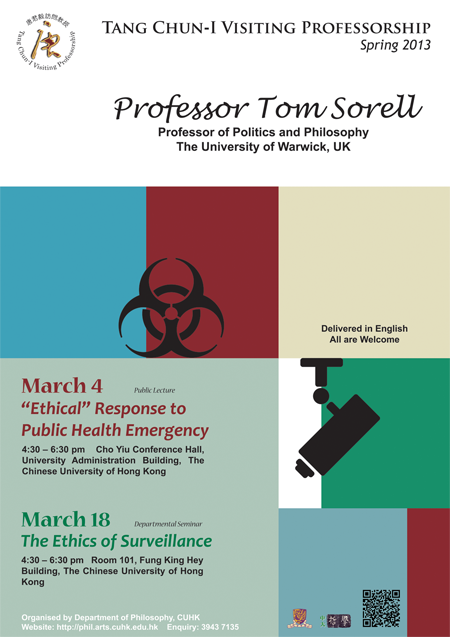 Professor Sorell has been invited to give talks and lectures in numerous universities, including the Heffer Public Lecture in 2000 at the Cambridge University. He was also a Faculty Fellow in Ethics at Harvard University in 1996–97. Professor Sorell is a renowned scholar in a broad range of subjects, including moral theory, applied ethics, scientism, Hobbes and Descartes. In addition to over a hundred published articles, Professor Sorell has authored or edited 18 books, including Hobbes (1986), Descartes (1987), Scientism (1991), The Cambridge Companion to Hobbes (1996), Moral Theory and Anomaly (1999) and Descartes Reinvented (2005). Emergency ethics is not the ethics of the normal situation. Taking as a case study the 2007 UK plan for responding to an avian flu pandemic, I argue that the plan was defective and that the ethical guidance provided by the government to health authorities was also questionable. The guidance was incorrectly modeled on ethics as usual. The failings of the UK plans tell us something important about ethics and something important about the relation of ethics to normality. Criticism of surveillance is often an indirect criticism of the uses of state power against individuals. Although this sort of criticism makes sense for jurisdictions like the former East Germany, liberal Western jurisdictions are routinely called “surveillance states” on account of the proliferation of cameras, and on account of the uses of surveillance since 9/11. This use of the phrase “surveillance state” is based on a number of mistakes. In any case, states are not the only actors that use surveillance, and an ethics of surveillance has to extend to the whole range of these agents. A general ethics of surveillance has to consider whether there is something wrong with surveillance regardless of the agent of surveillance and regardless of the power of the agent of surveillance. The answer to this question is not simple.